North American Monarch butterflies do not like cold weather, so every fall they head south for the winter. 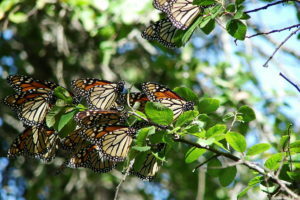 According to Monarch Watch, the Monarch’s migration is driven by seasonal changes. Shorter days and lower temperatures influence the movement of the Monarch. 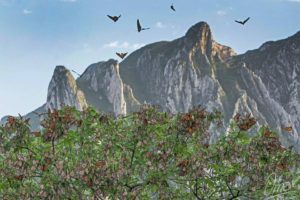 They fly at speeds ranging between 12 to 25 miles an hour using updrafts of warm air, called “thermals,” to glide as they migrate on their 2500-3000 mile voyage from the Great Lakes in Canada to the warm Central Mexican oyamel fir forests in the mountains of Michoacán. All along their migratory route, they will join together at night in clusters called roosts to rest. Sometimes they roost overnight, and other times they will roost in the same place for several days, waiting for optimal weather to head back on their southern journey. Scientists believe this roosting behavior provides safety from predators. A monarch butterfly weighs less than 1 gram, about what a paper clip weighs, yet they are able to travel 1500-2500 miles to their over-wintering grounds. And according to Journey North, they have been known to fly as high as 11,000 feet. Most migrating songbird migrations occur in a range of 2000-4000 feet high. 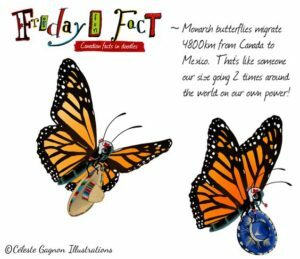 Not all Monarchs migrate to Mexico. 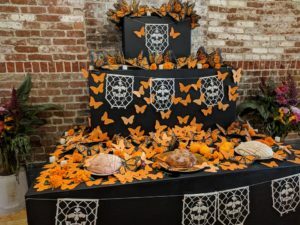 Monarch butterflies that live on the west side of the Rocky Mountains overwinter in eucalyptus and pine trees in various places along the California coast between Sonoma County and San Diego. 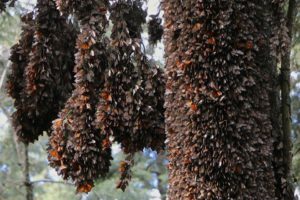 A cluster of Monarchs in Goleta. Click here to see more over-wintering sites in California. 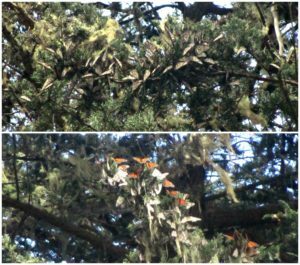 Monarchs roosting in Eucalyptus trees in Pacific Grove. Notice how in the first photo it is hard to see the butterflies. Millions of butterflies will stay for the winter months high up in the trees, protected from the cold weather. 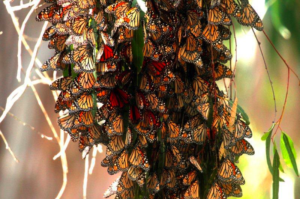 Tens of thousands of Monarchs can cluster together on one oyamel tree in order to keep warm. As warmer weather arrives, the Monarchs will become more active flying down to sip water in nearby streams. 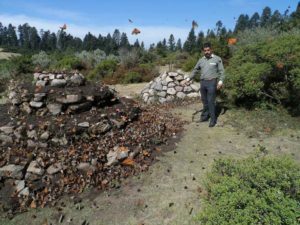 Click here to watch A “cascade” of monarch butterflies at an overwintering site in Mexico – an incredible sight! In late February these Monarchs will begin their northern travels back to the United States and Canada. They will mate and lay eggs along the way where they find flowers to nectar on and milkweed for their young. This generation will not make the trip back form their starting point. They leave that journey for their children and grandchildren. 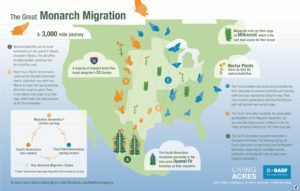 Map of Monarch Migration courtesy of BSAF Living Acres. 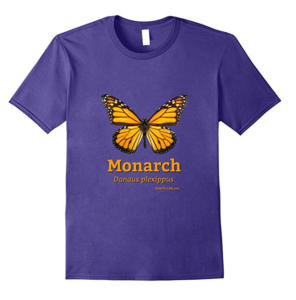 Celebrate the Monarch butterfly migration with this t-shirt.